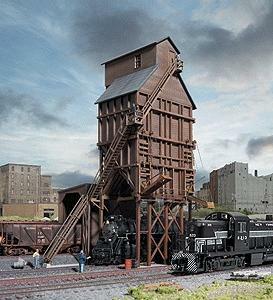 This is the N Scale Wood Coaling Tower - Kit - 3-5/8 x 2-1/4 x 6-1/2'' from Walthers. Coaling towers are an essential part of any steam-era layout. Based on an American prototype, this tower is typical of those found at smaller terminals as well as stations and junctions; similar towers were also found out on the mainline depending on the capacity of the road's tenders. Similar towers, constructed of wood, could be found on most railroads from the late 1800s well into the 1950s and a few survive on tourist and museum lines today. You can create a complete steam-era servicing facility with this kit and the Modern Roundhouse (#933-3260), which can be expanded up to a full-circle with additional Add-on Stalls (#933-3261); Machine Shop (#933-3264), Sanding Tower and Drying House (#933-3813), Cinder Conveyor (#933-3816), assembled 130' Turntable (#933-2613), and assembled Steel Water Tank (#933-2601).